What we do-CHAB Schools, Siem Reap? People living in poverty stricken areas suffer poor environmental health due to unsafe drinking water. They also have poor hygiene behavior and lack of sanitation due to rapid and haphazard urbanization leading to crowded and unhygienic settlements. Many families suffer massive financial losses through health expenses on diseases that could be prevented very easily. The vulnerable population, especially women and children, are being targeted by CHAB to improve their health and wellbeing. Specifically, the focus is on improving access to safe drinking water and guaranteeing access to better sanitation facilities. Additionally, the dissemination of better hand washing practices and other hygiene behaviors leads to a reduction in water-borne diseases and ultimately a reduction in health costs. A lack of clean water and sanitation can mean that diseases spread causing illnesses and diarrhea, which in turn leads to children’s absenteeism from schools. Poor health affects the children’s ability to learn and without education how are these children ever expected to break out of poverty. The provision of safe water and sanitation facilities in schools is imperative as it will create a healthy and safe physical learning environment, benefiting both the education and health of school children. We also to look at the use of latrines and the related appropriate hygiene behavior of school children. 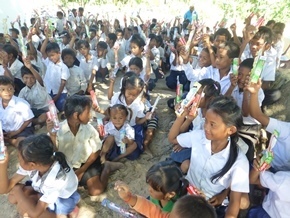 Educating school Children on basic hygiene and sanitation is very important because; most children are eager to learn and can therefore instill and promote positive behavioral change in other children; children have important roles in household chores related to hygiene, and can therefore instill change within their families and communities. These children are also future parents who will pass on the good hygiene practices that they learn in school to their children. drinking water and adequate sanitation and hygiene facilities remains a challenge, particularly for families in rural areas of Siem Reap. Polluted ponds and rivers remain the main resource of water for cleaning, bathing and drinking, and access to latrines and hand washing facilities in the home and at school are limited. Diarrhea caused by drinking contaminated water is still a leading cause of illness and death among infant and children in remote villages of the poor country like Cambodia. Over 5 children die every day as a result of diseases that cause diarrhea. More children die from diarrhea illness such as cholera dysentery and typhoid fever, than from HIV and malaria combined. One of the most pressing issues facing rural villagers in Siem Reap, Cambodia is a lack of clean water. Our wells now plan to provide safe drinking water for over 50 rural Cambodians. But there are hundreds of thousands of Cambodians who are drinking and washing with dirty and disease-ridden water. Please help us give the gift of clean water with your small donation. How Can You Help Us to Make a Difference? A pump well price ranges from USD 350.00 dollars to USD 2000.00 dollars in accordance with the distance, quality and size of the well. The average cost is USD 350 dollars per small pump well. For the giant well is $1600 to $2000. Rural communities or villagers can use the giant well both raining and drying seasons because it’s quality and strong and it’s however drilled very deep (30-40 meter deeps). The rural people do not worry about lacking water. Any amount you can contribute toward the project will be greatly appreciated. 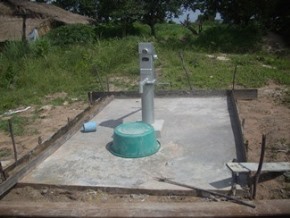 Once your donation is received, the well will be completed in 15 - 25 days. Photos of your plaque, families and well will be sent to you with names of the well beneficiaries. In order to achieve this objective, CHAB’s clean water project’s development will continue to work with communities to provide clean drinking water. Donate now..
Would You Consider to Help Provide Clean, Safe Drink Water for a Poor Family? CHAB is only an agency of sponsors or donors who would like to help provide clean, safe water to the poorest families in far rural villages. CHAB can bring sponsors or donors to see the real areas of those poor families. Tell, discuss or talk with us if you want to help provide clean, safe drinking water the far rural families. We show every donor the specific impact of their gifts through photos, short stories coordinates of every project. We follow up, monitor and evaluate the projects you support to help ensure our shared work has a long-term impact. We believe that every supporter can be part of the story of water by learning, acting, giving and then seeing the difference they make. We're looking for willing hands...are you ready? CHAB’s work on water, sanitation and hygiene supports Sanitation and Hygiene, with emphasis on reaching the unreached among remote communities.